Can I Use Images of Celebrities For My New Brand? Social media has enabled free access to celebrity photos, images, and videos for every person. But, free access does not necessarily mean free use. There are rules around using someone else’s image, especially a celebrity. We set out the legal risks for brands using another person’s image in their marketing campaigns or product designs. If you launch a new clothing line featuring Ellen Degeneres or Kendall Jenner but are not defaming the women or claiming to be selling the clothes on their behalf, does this mean it’s ok? Not necessarily. Using an image of a celebrity or a well-known personality without obtaining a licence may open yourself up to a world of legal consequences. If you are creating your own images and using a celebrity’s photo as inspiration (e.g. a caricature of Morgan Freeman), then you may be in the clear. In Australia, there is no ‘right to publicity’ or ‘image right’ that allows a celebrity to control the use of their image. However, they can rely on the Australian Consumer Law (ACL) and the common law ‘tort’ of passing off if a business misuses their image (a ‘tort’ is a legal wrong). So, whether you are duplicating a celebrity’s image or using it for inspiration, you should consider the following to minimise your legal risk. Passing off is a common law action used where there has been a misrepresentation that goods or services are associated with another. this misrepresentation causes or is likely to cause damage to their image. If your new clothing line is likely to persuade your customers that your brand has some connection with that celebrity, then the celebrity can bring an action of passing off. Similarly to the common law tort of passing off, the ACL specifically prohibits engaging in conduct that could mislead or deceive consumers. Section 29(1)(g) A person must not…make a false or misleading representation that goods or services have sponsorship, approval, performance characteristics, accessories, uses or benefits. This law protects every business, brand and person — not just celebrities. However, when the image used is of a well-known person or brand, there is a higher risk of misleading the public to believe that there is an association or endorsement. 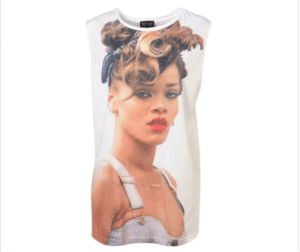 In 2012, Topshop brought out a t-shirt bearing the image of Rihanna. Rihanna had goodwill and a reputation in her image. Although using an image of a well-known person does not necessarily result in a misrepresentation, in this case, Topshop made an effort to establish an association. Topshop ran competitions, made statements about Rihanna’s visit to their store and tweeted on social media about the pop star. As a result, the judge decided that Topshop’s conduct was likely to mislead consumers that they had an association with or endorsement by Rihanna. The damage caused included a lost financial opportunity for licensing the right to use her image and potential loss of sales for her own merchandising. Whether you are using photographs of celebrities from the internet or using them to inspire your own creations, you may be opening yourself up to claims under the ACL or the common law tort of passing off. A celebrity must prove that the use of their image could lead consumers to believe that there is a relationship in place to succeed in their claim. It’s not enough to simply say that a brand has used their image without permission. If you are considering using a celebrity image as part of your marketing or product design, get in touch with LegalVision’s intellectual property specialists on 1300 544 755. Alexandra is a Bachelor of Arts and Bachelor of Laws graduate from Deakin University. She has a particular interest in intellectual property law, startups and all things creative. Alex has worked at KPMG in their tax team and in private legal practice, specialising in IP, family and commercial law. Would you like to get in touch with Alexandra about this topic, or ask us any other question? Please fill out the form below to send Alexandra a message! How Do Successful Brands Make Money Off Their IP? Which Trade Mark Classes Do I Choose if I Plan to Expand My Business?